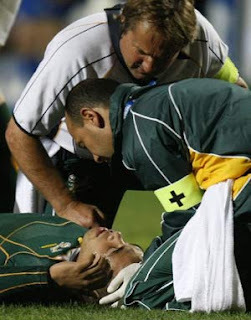 every sport has its injuries. so the saying goes. and surgery is no exception. it was a thyroidectomy for multinodular goiter. not like the monsters that the state was inclined to deliver, but a routine straightforward private thyroid. the only catch was that she was hiv positive and not on antiretrovirals. the cd4 count was low but acceptable so i went ahead. the operation went without any hitches. quite soon i found myself placing the last skin sutures. and then... i stuck the needle into my finger. let me assure you, that is not the greatest feeling. anyway, before the next case the first dose of antiretrovirals had passed my lips and i felt slightly consoled. only slightly. the month flew by quite quickly actually. the only side effect i experienced was diarrhea but, truth be told, that was bad enough. i actually considered suggesting antiretrovirals as suitable bowel preparation for colonoscopies. no one took me seriously. thereafter i needed to have the obligatory test. the only problem is in such a small place as the town where i live, if i tested positive, within a week everyone would know my status. if it were to turn out positive, i would basically have to shut down shop and find another town to ply my trade. who would go to a surgeon with hiv? i had to have the test done anonymously. i approached my good friend, the pathologist at the lab. he understood my situation and agreed to do the test for me under an assumed name (i think it was something like 4739). that friday he drew my blood. i was on call so i immediately disappeared to theater. he assured me he would call me in an hour. an hour passed. another hour passed. i tried not to panic as a third hour passed. to phone him would show a serious loss of cool but after another hour i didn't care about that anymore. i got his voice mail. at that stage i started making plans in my mind for my new practice in a small town in another province. a friend of mine there was looking for another surgeon to join their partnership. like most places in the country they were overworked due to the country wide shortage of general surgeons. it would be a pity to have to start from scratch but the fact that i had heard nothing from the lab implied i must be positive, or so i reasoned. the fear of hiv is a part of the job. occasionally taking antiretrovirals is also part of the job. in a setting where probably 30 to 40% of the population has the virus it is inevitable to have contact occasionally. it is just one of the things we must face day to day. then he finally phoned. they had done all the tests imaginable and i was negative. the relief was difficult to describe. when you've seen the effects of the virus so many times, especially the dementia syndrome it causes, the fear of it is a constant cloud over your head. the moment of sunshine then was beautiful. Waiting is tough. Fear is draining. Glad you got sunshine! Just another unneeded stressor in an already stressful job. Glad it was negative. Do you have much hepatitis C in RSA? I imagine there must be. We see a lot of it here, but I'm at a liver transplant center so that may skew my view. What ever happened to the patient with the huge thyroid from the previous post? I'm both amazed and grateful that there are still great people like you who have stayed and continue to work in the conditions that now prevail in RSA. Hats off to you. walt, b is algemeen. c minder so.